Paris: French Prime Minister Edouard Philippe has vowed to “restore national unity” after violence broke out during a fourth consecutive weekend of protests. “The dialogue has begun and it must continue,” Philippe said in a televised statement. “The president will speak, and will propose measures that will feed this dialogue.” he said. Discussions with peaceful protesters “must continue”, Mr Philippe said. Police used tear gas and rubber bullets on Saturday the latest day of “yellow vest” demonstrations against fuel tax rises and high living costs. Almost 1,000 people were taken into custody but the violence was not on the same level as a week earlier. Interior Minister Christophe Castaner added that 125,000 “yellow vest” protesters had turned out to demonstrate around France on Saturday. According to the France 24 news channel police detained 1,385 of them after they found weapons such as hammers, baseball bats and metal petanque balls on them. About 89,000 police officers were on duty on Saturday. Some 8,000 police officers have been deployed in the capital city to avoid a repeat of last Saturday’ ‘s mayhem when rioters torched cars and looted shops off the Champs Elysees boulevard, and defaced the Arc de Triomphe monument with graffiti directed at President Emmenuel Macron. 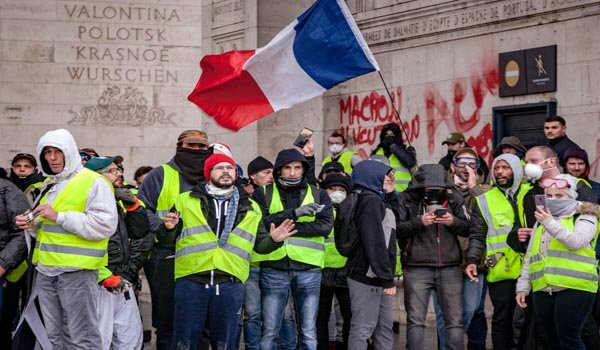 Macron’s government has warned that the protests will be hijacked by “radicalised and rebellious” crowds and become the most dangerous yet, after three weeks of demonstrations.